Being dedicated to practice helps build a repeatable swing. A repeatable golf swing is one the golfer is able to execute with precision over and over, whether on the practice range by himself or at a crucial stage of a match with his buddies. In golf, "repeatable" is another word for "reliable." You can step up to the ball each time with confidence that you can hit the ball close to the intended target. Assess your physical abilities. If you watch the line of golfers at a busy practice range, you will see that there are many types of golf swings. Size, strength, age, fitness and natural athletic ability all affect the golf swing. You may not be able to swing the club all the way to a parallel position at the top of the swing, for example, and trying to do so may throw you off balance or cause you to move your head. Legendary golfer Jack Nicklaus reminds us in his book, "Golf My Way," that a golf swing can't be Xeroxed -- each individual designs his own ideal swing to fit his strengths and weaknesses. Focus on sound fundamentals. Learn the right grip, stance, posture and alignment by taking lessons from a PGA professional. Start with a firm foundation for building a successful, repeatable swing and you won't have to spend time unlearning bad habits later on. Find a tempo that works for you. Watch expert golfers and you will see that the tempo of their swing does not vary significantly, regardless of whether they are trying to boom a tee shot 300 yards or hit a deft pitch to a tiny green. Through experimentation, determine whether you naturally swing at a fast tempo or a slower one. Make sure you employ a similar tempo on all golf strokes. Groove your swing through consistent practice. 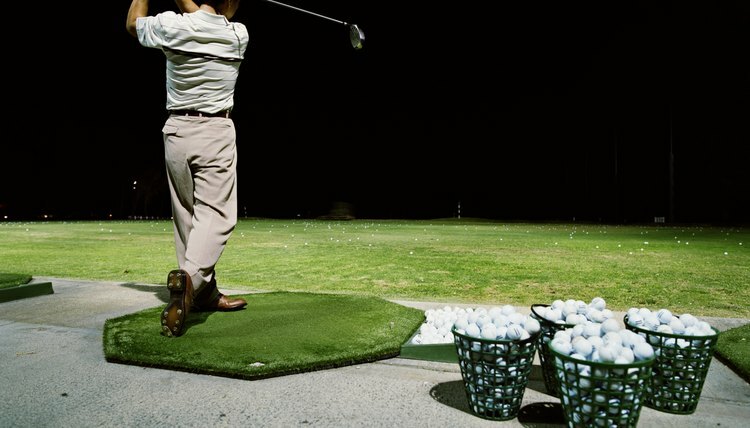 Teach your muscles what you want them to do by spending focused time on the driving range. Make sure you practice as though you are playing a shot that counts on the course. Select a target and measure the success of each practice shot. If you can increase the percentage of successful shots over time, you are on the way to building a repeatable swing. Develop your own swing keys. Swing keys are memory devices that are recalled right before you start the backswing. They can help prevent mistakes – such as remembering to keep a steady head – and help you hit the ball farther by remembering to make a full shoulder turn, for example. The more you practice and play, the more naturally these keys will occur to you. Is it Better to Slow Down Swing Speed in Golf?